Well after 4 months & a half months to date in Oz, we finally left New South Wales & headed a couple of hours up the East Coast to Surfers Paradise on the Gold Coast. We'd almost decided to skip Surfers as we'd heard pretty bad reports that it has nothing going for it other than the beach but as we had our pre-paid Greyhound pass we thought we might as well take a look even if only for a night or two. The first thing we noticed was the considerable increase in temperature after crossing into QLD, about time too! We were booked into the Cheers Backpackers & after reading that it was Surfers only 5* hostel, we were looking forward to a bit of luxury. What a joke that was! It was possibly the worst we've stayed in so far, the kitchen was so skanky I didn't even want to make a cup of tea in it & there was no communal TV or common room, so your only options if you weren't heading out for the night were to sit outside on ridiculously low & uncomfortable picnic benches or go to bed early, which under normal circumstances would have been fine - might as well catch up on some sleep - but when you appear to have a bedbug infestation, it's the last place you want to be! You will notice in future entries that bedbugs have now become a bit of a paranoid obsession of mine, upon checking into any new hostel, I soak my mattress & sheets in insect repellent & don't allow have an inch of skin uncovered while sleeping if I can help it. Even when there blatantly aren't any, I swear I can still feel them itching my skin! The day after we arrived we woke up to glorious sunshine so we headed to the beach. I can see why many people don't like Surfers, it doesn't really feel like Australia. It's more like a cross between New York & Tenerife, with the beach-scape dwarfed by the never-ending highrises. And by 3pm, the bloody buildings throw huge shadows across the sand so you have to get up & move every 10 minutes to keep in the sun! Having said that, the beach itself is gorgeous. 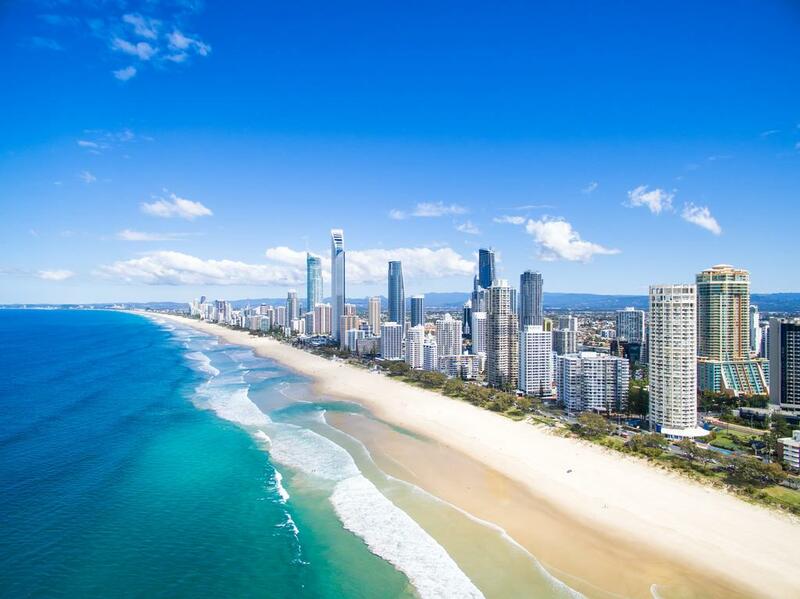 The Gold Coast is actually 25 miles of golden beach. The sea was a bit too cold for swimming though but we were content with a day's sun-worship. That night we headed out with a group of people from Cheers, with every intention of only staying for a few as the plan was to leave the next day & head to Brisbane to try & find work. However, a few soon turned into a few too many & before you knew it, we'd been talked into cancelling our bus the following morning & staying in Surfers to try & find work. It's amazing how convincing people become when you've been on the vodkas! So the next morning, we dutifully took our hangovers out along with a stack of CV's to pound the streets. The advice we'd been given did turn out to be quite spot-on, because very few travellers spend any major amount of time in Surfers, there seemed to be a fair bit of work around. I did try to be open-minded & apply for anywhere & everywhere but even I had to draw the line when Lin & Jill started filling out applications for Hungry Jacks (a.k.a Burger King!) By the end of the day, all 3 of us had 2 hour 'trials' arranged for waitressing jobs so we decided to give ourselves until the end of that week & if we didn''t have definite job offers by then, we'd move on. The following day, we moved over to the Islander Hostel in the centre of town as I refused to spend another night at the bedbug palace. That night I had my trial-shift at La Gitara, a little A La Carte Italian restaurant. All went well & I was offered the job but the manager was the most warped, bitter & twisted old man I've ever met! I decided to grin & bear it purely for the money but I then spent the next 2 weeks enduring regular rants on all that's wrong with the world & how much he hates the Aussies, who in his opinion ''eat cheap, live cheap & will die cheap"! It was all I could do not to ask him why he didn't w*** off back to Italy then! Luckily, a pure godsend came my way shortly after when he told me that due to how quiet business was, he had to cut my hours & do the waiting himself on the night shifts, but did I want to take the pot-wash job, as he'd sacked the Brazilian pot-wash guy the night before? Needless to say, I politely declined & happily went back to unemployment! About a week after that, we met some Irish girls at our hostel who had just started tele-marketing jobs that were paying $600 per week, untaxed. Jill hadn't been getting many hours either at her restaurant so we decided to look into it. After a 5 minute interview, we were both offered jobs starting the following monday, so we accepted & decided not to tell them that we were literally only going to work monday to friday as we were leaving for Brisbane that sunday! It was the easiest $600 I've ever made. The marketing was on behalf of an investment company & the calls were all scripted. All we had to do was get people to agree to be sent a free info pack on the investment opportunity. Both Jill & I started racking up the leads, these Aussies just love to chat to a Pommy girl & as the whole company was having such a good week, we were sent home early (with full-pay) nearly every day. On the thursday, they sent us home at 11.30am & on the friday, we finished at 12.30pm but then had to go to 'compulsory free work drinks' for a few hours. It was tough, let me tell you! And luckily they were fine about us quitting after just 1 week so we left on a good note. All in all, although Surfers Paradise was the last place in Oz that we wanted to spend a whole month in, it was a bit of a blessing in disguise as not only were we earning but we also saved a fortune (our accommodation was only $15, approx 6 quid a night) & because the nightlife was so dire, we only went out about 4 times in the whole month. I have never watched so much TV in my life! I became addicted to Aussie Big Brother, as well as the usual favourites like Neighbours, Lost & Desperate Housewives. We also made some friends, the Essex Boys - John, Scotty & Luke who we spent quite a bit of time with, watching DVD's round their plush apartments. We also had some in-house entertainment, as our hostel was filled with some of the most deranged freaks I've ever met. First there was talking-gurner man, an alcoholic who looked like he had no teeth & who wasn't actually staying at our hostel but lived there during the day, sleeping on the sofas in the TV room & using the hot-tub as his bath. He was always drunk & would have us in stitches as he had full-on lengthy conversations with himself & would crack up laughing at God knows what on a regular basis. Then there was 'the man from hell' (his words not ours), who scared the life out of us when we were watching TV one day & heard someone screaming blue murder out on the balcony. We ran to the kitchen thinking a huge fight must have broken out but oh no, it was just Hell-Boy, drunk, screaming abuse at poor innocent passers-by in the street below. At the very least, the resident freaks made our time in Surfers more amusing!